The case of John Hugh Smyth-Pigott is the most irrefutable, clear, and undeniable case demonstrating the falseness of Ahmadiyya. 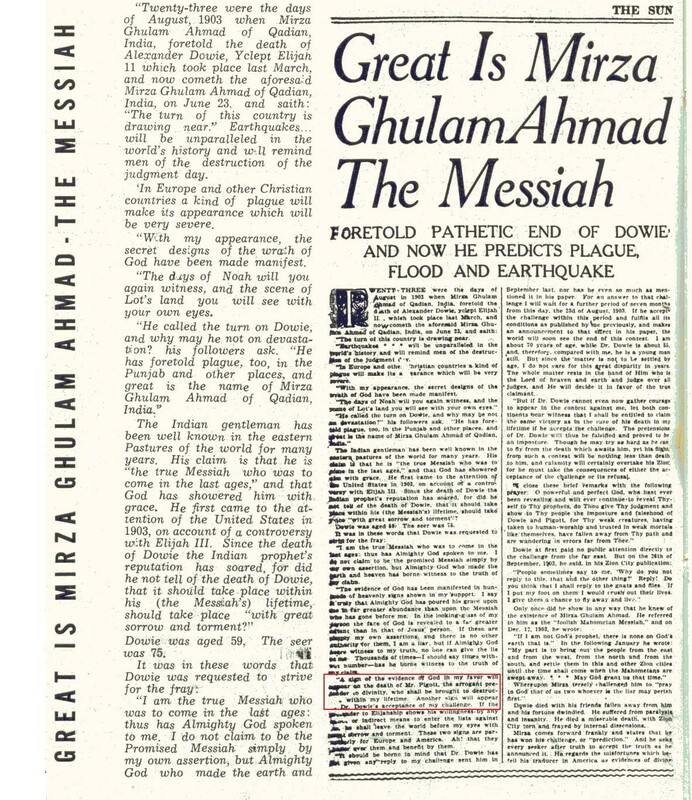 The founder of the ahmadiyya, Mirza Ghulam Ahmad Qadiani, made numerous claims, such as claiming to be a prophet. His followers often cite his prophecies as proofs of these claims. Mirza himself has told us there’s no better way to judge his truthfulness then his prophecies. Mirza Ghulam Ahmad claimed in 1902 that John Hugh Smyth-Pigott would die during his lifetime due to Pigott’s claim to be Jesus/God. This did not occur. Pigott died in 1927, while Mirza died in 1908. 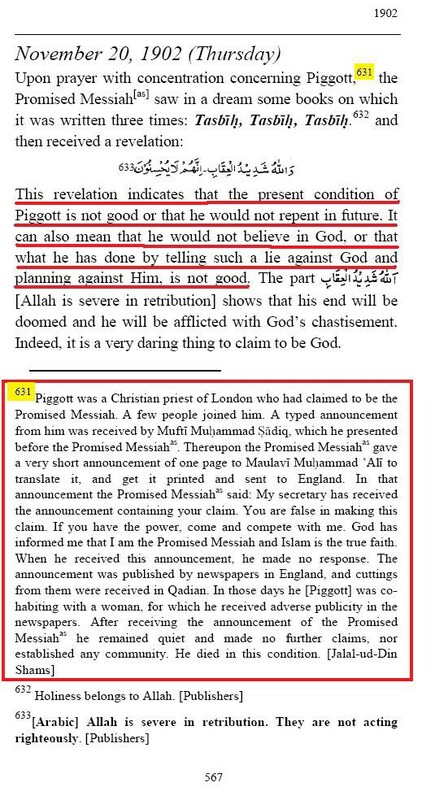 Ahmadis say this was because Pigott repented of his claim and stopped. This argument can easily be shown false. I have proof that Pigott was claiming to be God in 1904, 1905, 1906, 1908 (3 months before Mirza died), and in 1909, after Mirza died. Pigott, as we mentioned earlier, claimed that he was Christ, and in a Christian background (he was a priest in England), he was also claiming divinity. When Mirza learned of this claim, which is effectively a rival claim to his (as Mirza claimed to be the Messiah) he sent a letter to Pigott. He dictated the letter to Muhammad Sadiq, a companion of Mirza that knew English. The letter is dated 24th November 1902. It is signed “Mirza Ghulam Ahmad, The Prophet”. The letter is quite explicit. Mirza says “If I die before Mr. Pigott, I am not the true Messiah nor am I from God”. Go to page 29 if going by written numbers on the pages, page 31 if going by the PDF reader’s numbering. This proves the letter is authentic, as even the ahmadiyya have published it. 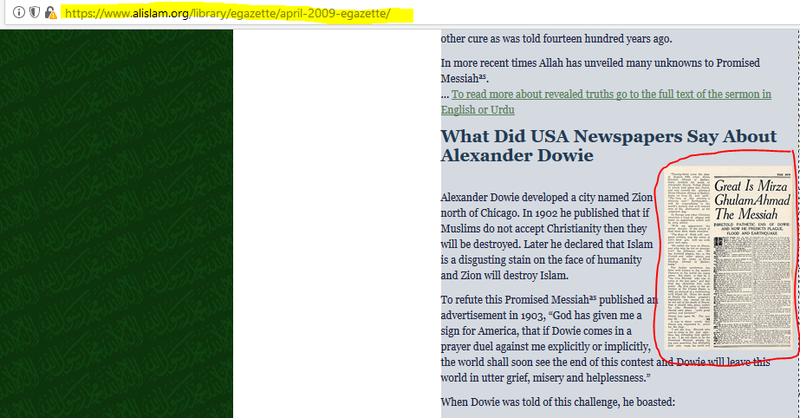 Unlike the case of Dowie, where he continued making false claims and angrily responded back to the Promised Messiah as through the media, Reverend Smyth-Pigott totally retracted public claims and retreated. It is perhaps for this reason he did not die in the lifetime of the Promised Messiah (as). Indeed he lived on and died in 1927. You can decide if this claim holds water when you finish this piece. A sign of evidence of God in my favor will appear in the death of Mr. Piggot — the arrogant pretender to divinity, who shall be brought to destruction within my life time. The above screenshot also confirms a letter in English was sent, and had been dictated to Muhammad Sadiq by Mirza. So when did Pigott die? 1927. Mirza Ghulam Ahmad died in 1908. Now to get around this and maintain belief in Ahmadiyya they claimed he did repent, as is done in the Gazette article and Tadhkirah footnote from above. This is easy to test. Let’s take a look at the timeline of events. Mirza warns Pigott in 1902. The Rev. Smyth-Pigott, the self-styled “Messiah” of Clapton; and the leader of a sect called the Agapemonites is again receiving the attention of the London Press. It seems that the that the reverend gentleman whose claims to divinity caused a considerable stir some time ago, has left Clapton and is residing with his followers at the “Abode of Love” in Spaxton, Somersetshire, where he and about a hundred followers daily perform their mystic rites. He still claims divinity in blasphemous language. At a special gathering of his disciples on June 26 he again asserted his divine origin and dispensed blessings. Many of the Agapemonites openly worship him. This was in 1904, far after Mirza Ghulam’s 1902 letter. In another newspaper from 1904 we have another report of him claiming to be God. On Monday the Agapemonites held a service at which Pigott again declared, “I am the Lamb of God,” at which the congregation fell on their knees and worshipped him. Important Note: “Lamb of God” is a Christian term used to refer to Jesus Christ, who Christians believe is God. For a Christian to claim he is “Lamb of God”, this is to claim he is Jesus Christ, that he is the Messiah, and (because they claim Jesus is divine), it is also a claim to divinity. That is why they were worshipping him in the above quote. An account is required for the above newspaper archive, but the free trial should give you three free uses. After going through the signup try the link above again while logged in to get to the page. This archive is linked elsewhere in this page for other papers. 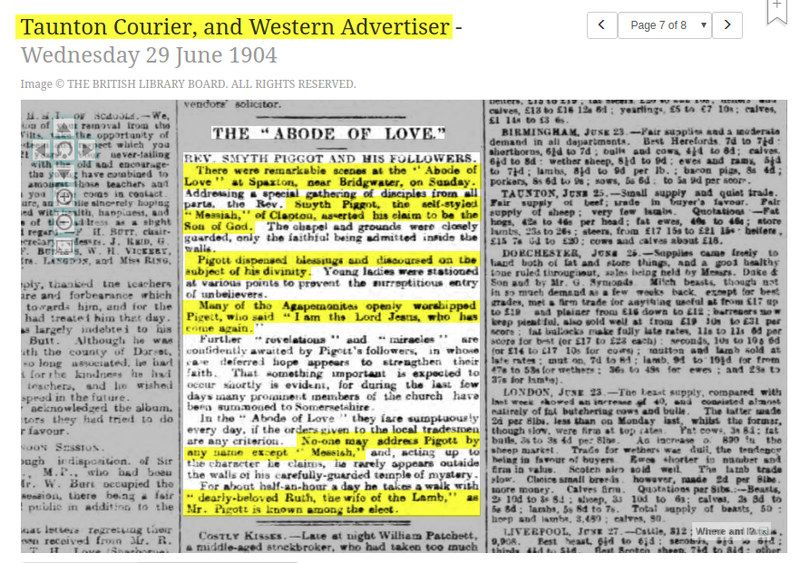 So we’ve seen multiple different contemporary newspapers in 1904 that were asserting Pigott was still openly claiming divinity at multiple events. This service where Pigott again claims to be God, and blesses his followers is from 1905. It is the account of a reporter who was present. Thus it is eyewitness testimony. They told me that Mr. Pigott was the Messiah and that he was the Lord come a second time on earth… I spoke my mind to them… I said, ‘just you get out of my house…’ and they soon went when they saw I was getting my temper up. In a different newspaper in 1905 Pigott’s close followers said “you are about to be admitted into the presence of the Almighty!”, to a registrar coming to visit Pigott. The same newspaper article had a discussion with the personal secretary of Mr.Pigott; Mr.Reed. The papers have said all sorts of things about us, and we are despised just as Jesus was when He came on earth. We have Jesus with us. Brother Prince said Jesus would come amongst us again, and He came and was revealed unto us at Clapton two years ago. After he says this, the reporter asks him “Do you mean Mr. Pigott?” and Mr.Reed replies with yes. 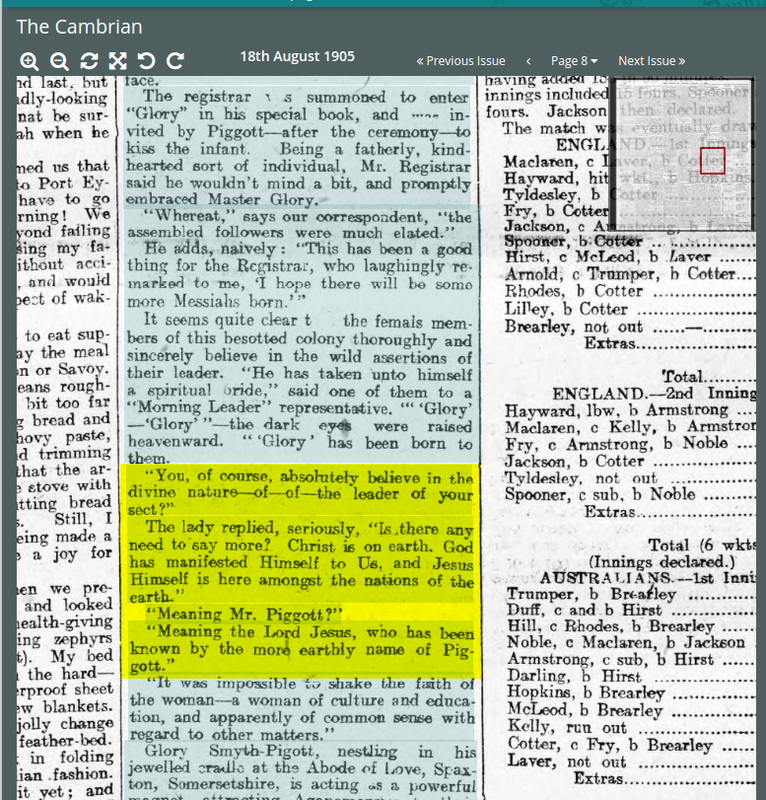 Now we’ve seen three different contemporary newspapers in 1905 that were asserting Pigott was still openly claiming divinity. An account is required as mentioned earlier. “Mr Frank Edward Farncombe stated that in February 1908, he obtained admission to the Agapemone and had some conversations with Smyth-Pigott. 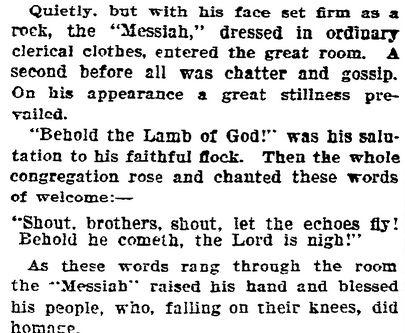 — HAWERA & NORMANBY STAR, VOLUME LVI, 8 MARCH 1909. So someone in February 1908 personally asks Pigott about “how he established his claim to the godhead”. This means people still understood Pigott to be claiming to be God. Pigott’s reply is not denying that he is God, he just tries to answer the question as to how his claim is established. But he then says it’s a mystery unless you are properly initiated. This, coupled with all the other newspaper clippings, show that he did not retract his claim to being God/Messiah/Jesus. 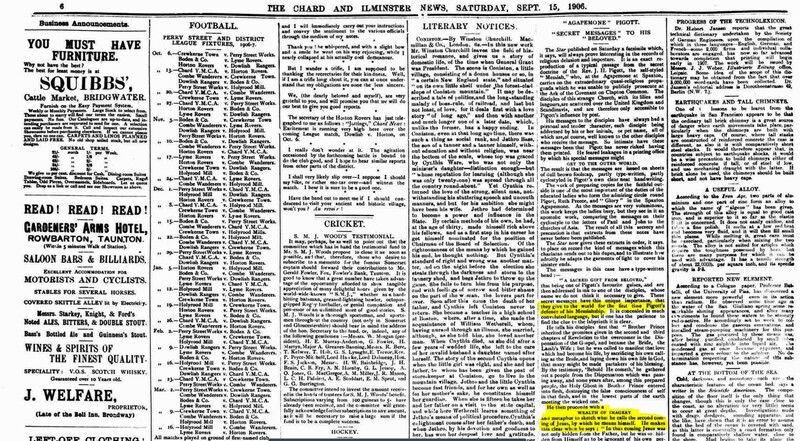 Mirza then dies on May 26, 1908, a few months after this February 1908 event. His sect/cult continued after his death and his followers did not stop worshipping him during his lifetime, and some continued to worship him after his death. One of its cottages, North Gate, a four-bedroom gabled house built for followers in 1916, is for sale for £295,000. After Smyth-Pigott died in 1927, the community went into gradual decline, ending with the death of the last surviving member, Sister Ruther, at the age of 90 in 1956. The following year, the Agapemone and its contents were auctioned. It’s clear Pigott did not repent. 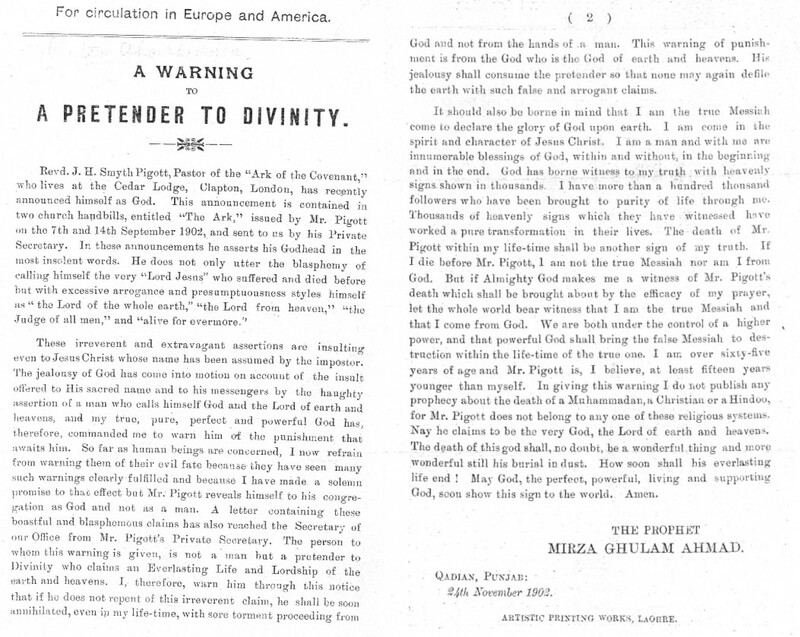 Pigott claimed to be God after Mirza’s 1902 letter. In 1904, 1905, 1908 (3 months before Mirza’s death), and after’s Mirza’s death. His followers said he was Jesus Christ who come again to this world and they openly worshipped Pigott in front of him throughout this period. This is pretty clear cut. Mirza gave us a clear objective test and has told us if he fails this, he is not the true Messaih nor is he from God.